The Rochelle Noir mirrored armoire is a beautiful example of traditional design. Inspired by regal 18th century pieces, this armoire is constructed from mahogany wood and features heavily carved intricate details. 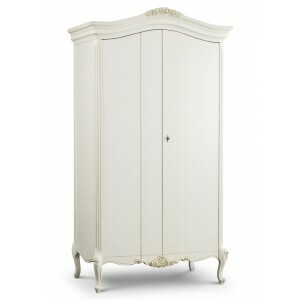 Internally, this armoire contains two adjustable shelves, a hanging rail and two metal hooks for ample storage. This piece is finished magnificently in an attractive antique black finish, accomplished by matt black paint and light grey patina, highlighting the sumptuous details of the piece. Delivered assembled, however can be dismantled. Note: This item may require assembly upon delivery at an additional charge, please enquire with our sales team.